HCA Healthcare/HealthONE has announced the appointment of Ryan Simpson as President and Chief Executive Officer of The Medical Center of Aurora (TMCA) and Spalding Rehabilitation Hospital effective October 1, 2018. 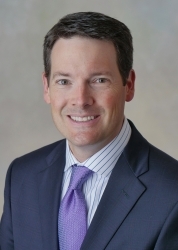 Aurora, CO, September 12, 2018 --(PR.com)-- HCA Healthcare/HealthONE has announced the appointment of Ryan Simpson as President and Chief Executive Officer of The Medical Center of Aurora (TMCA) and Spalding Rehabilitation Hospital. Simpson, currently the Chief Operating Officer at Swedish Medical Center, will begin his new role on October 1. Simpson will replace Dan Miller, who is leaving TMCA and Spalding after being appointed CEO at HCA Healthcare’s Methodist Hospital and Methodist Children’s Hospital in San Antonio, Texas. Simpson has been with HCA since 2010 and during his time at Swedish, he was instrumental in relocating Colorado’s largest urology practice to the facility, resulting in a 40% increase in robotic surgeries. He led over $80 million in construction projects that included building a new hybrid OR, a cath lab expansion, and a surgical robotics OR expansion. He also led tactics that improved physician engagement to top-decile performance in HCA. During his time at TMCA, Simpson led numerous development, construction and renovation projects across campuses totaling over $70 million. Among the projects were the renovation of TMCA's perioperative services, intensive care unit, emergency departments, Saddle Rock ER, and the establishment of a behavioral health campus. Simpson received his Bachelor of Science in Business Administration from Birmingham-Southern College in Birmingham, Alabama. He received his Masters of Science in both Business Administration and Health Administration from University of Alabama at Birmingham. At TMCA, Simpson will oversee the award-winning medical center’s six campuses, which include two freestanding ERs (Centennial Medical Plaza and Saddle Rock ER), Spalding Rehabilitation Hospital Aurora and Spalding Rehabilitation at Presbyterian/St. Luke’s Medical Center, TMCA’s Behavioral Health and Wellness Center, and a vast array of other services. TMCA is a Level II Trauma Center, has Chest Pain Center accreditation, Atrial Fibrillation with EPS accreditation, is a Joint Commission Accredited Primary Stroke Center, and the HealthONE Behavioral Health Services hospital. Simpson and his wife, Johanna, have two children. The Medical Center of Aurora, the first community hospital in the Denver Metro area to receive two-time Magnet designation for nursing excellence by the American Nurses Credentialing Center (ANCC), is a 346-bed acute care hospital located in Aurora, Colorado. The Medical Center of Aurora is comprised of six campuses in Aurora and Centennial, Colo., including the South Campus, located at Interstate 225 and Mississippi, the North Campus Behavioral Health and Wellness Center, Centennial Medical Plaza, Saddle Rock ER, Spalding Rehabilitation Hospital, Spalding Rehabilitation at P/SL, and a medical office building at Green Valley Ranch. The South Campus facility is a Level II Trauma Center with Primary Stroke Certification and Chest Pain Center accreditation, and has an affiliation with Rocky Mountain Hospital for Children as well as the Sarah Cannon Cancer Institute. The Medical Center of Aurora received ‘A’ grades from The Leapfrog Group (Fall 2015, Fall 2016, Spring 2017, Fall 2017, Spring 2018), was Colorado’s only hospital to receive the Leapfrog Top General Hospital designation two years in a row (2016, 2017), and was recognized as a Best Regional Hospital by U.S. News & World Report (2014-2015, 2017-2018, 2018-2019). The Medical Center of Aurora and its affiliated campuses are part of the HealthONE System. Learn more at AuroraMed.com. HealthONE® is the largest healthcare system in the metro Denver area with more than 10,000 employees. As part of the HealthONE family, The Medical Center of Aurora, North Suburban Medical Center, Presbyterian/St. Luke’s Medical Center, Rocky Mountain Hospital for Children, Rose Medical Center, Sky Ridge Medical Center, Swedish Medical Center, and Spalding Rehabilitation Hospital work together to provide a higher level of care. In addition, our family of services includes six hospital free-standing emergency departments and numerous ambulatory surgery centers, occupational medicine clinics, physician practices, imaging centers, and AIRLIFE-DENVER, which provides critical care air and ground transportation across a 10-state region.